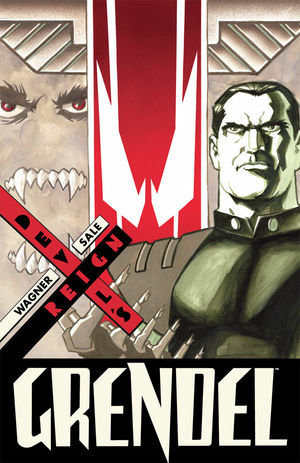 I never read the Comico run of Grendel while it was being published. My first exposure to the character was in the first Dark Horse series, Grendel: War Child, which features an android Grendel who is tasked with keeping Jupiter Assante, the child of the great Grendel-Khan, safe from a number of different threats. I loved the series. It was beautifully drawn (by Pat McEown - where is he now? ), and was set in an interesting world. It spurred me on to pick up some of the back issues of the series, but I somehow never read the story of Orion Assante, the Grendel-Khan, who united the world under his military leadership. At least, until now. This trade, which collects the last seven issues of the Comico title (later reprinted under its current name by Dark Horse), splits each chapter into two parts. The first part is written as a chronicle of the ascension of Orion I, in a tight eight-panel grid, of which many panels are simply prose. This part of the book follows Orion from being the leader of a small paramilitary force being used to track down and destroy victims of a vampire plague through the machinations that make him the leader of the entire world. This part of the book is a study in realpolitik as it is applied to a future society, and it's both very interesting and a little exhaustive. The other part of the book follows the story of the vampires, who have been imprisoned in the VEGAS sector of Calmerica. For a while, the vampires are allowed to run their casino for normal people, but as they start to disappear, the Grendel-Khan imposes more and more restrictions on them. These scenes are drawn in a more traditional comics style. Tim Sale uses the two sections of the book to great effect, drawing both tiny little panels full of people in the first section, and creepy subterranean dwellings in the second. Reading this book reminds me of how much I like Sale's art, and how pleased I would be to see him return to drawing comics. I think it's strange that, whenever Matt Wagner returns to Grendel, he always tells us more stories of the character's earliest incarnation, Hunter Rose. What happened in that series later on was so much more interesting, and I would rather see him mine some of his later ideas, or, even better, continue the story with all new material.